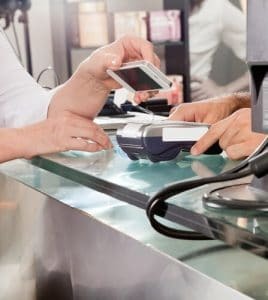 I wrote a blog back in October 2013 entitled “Innovating the way we pay” which explored the latest innovations in the way that consumers make payments (as the title suggests!). I reference this blog now because there has never been a bigger innovation in the way that we pay for goods than with the launch of the iPhone 6 and more specifically Apple Pay. Apple Pay is the iPhone 6 NFC technology. Two years on from the release of Passbook, Apple Pay allows users to add their credit card (or a virtual version of it) to their Passbook wallet. Apple Pay, accesses the credit card attached to the user’s iTunes account (or they can add a new card) and adds the card to Passbook. The user can then tap and go at payment terminals, completely eliminating the need for physical cards. Apple advise that they don’t keep the credit card number on any database, nor do they provide the credit card details direct to any merchant. Apple create a device specific account number and store it safely in the iPhone 6’s Secure Element chip. So that each time the iPhone 6 user pays for goods, Apple use a “one-time payment number” along with a dynamic security code to ensure all data is secure. If the user’s iPhone is lost or stolen they can use “Find my iPhone” and suspend all payments from their device. Because their credit card details aren’t stored in the device there’s no need to cancel credit cards and have to wait for a new card to be issued. One concern voiced by consumers and I think a valid one is around privacy. Will Apple know what consumers have bought and when? Will they be tracking consumer behaviour in any way? Apple advise that they are not in the business of data collection and that the transaction exists only between the user, the merchant and the user’s bank. I don’t use the word “revolutionlise” lightly. Apple have the big boys onboard, namely Visa, MasterCard and Amex. Apple Pay does not rely on Apple specific contactless payment terminals but rather will work with Visa’s PayWave and MasterCard’s PayPass. Retailers adding Apple Pay include Macy’s, McDonald’s, The Disney Store and Sephora. Needless to say the support for Apple Pay is impressive. That said, there is some resistance and most notably from the world’s largest retailer Walmart, reported by smh.com.au to have “snubbed” Apply Pay: (http://www.smh.com.au/business/world-business/walmart-snubs-apple-pay-sparking-payments-race-20140912-10fz3y.html) Instead, the retail giant will continue to develop a separate (and competitive) payment system in a race to define the payment landscape. Other retailers not onboard with Apple Pay include 7Eleven and Target. Regardless of who wins this race (the world’s largest brand or the world’s largest retailer), the launch of Apple Pay will result in a revolution in the way that consumers not only pay for goods but live their lives. It’s a giant step towards consumers being completely paperless. Why carry around a wallet full of paper when Passbook carries everything for you virtually? Your credit card, coupons, loyalty cards, tickets and more. I still think we’re a few years away from this becoming a practical reality but Apple Pay is one huge leap forward. I’m very interested to see how the payment war plays out but one thing’s for sure, it will play out and change the way we all consume.